During the second World War, La Roche was occupied by German soldiers. Of course, the Villa was chosen by the officers to establish their commanda structure here. In September 1944, La Roche was liberated by the Americans without damage, but in December 1944 the Germans suddenly came back where the battle of the Ardennes takes place. This time La Roche will not survive the battle unharmed: it was bombed by the Americans and almost completely destroyed. The Villa was also damaged when on January 17th 1945 it was attacked by British soldiers. Of the ever beautiful Villa only ruins remained. 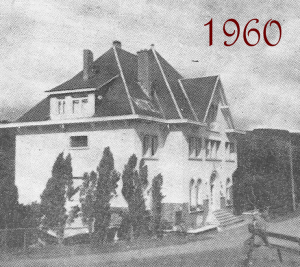 In 1958, the ruins of the Villa are bought by my family. 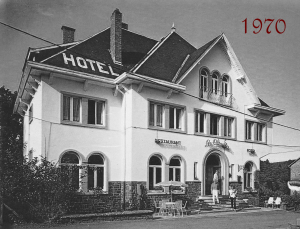 My father was a young butcher in La Roche and lived there with his beautiful young wife of 17 years, my mother… He had the downstairs room furnished to fabricate Ardennes hams. My grandmother has been dealing with the top of the house. They have started a family pension. The ideal location (and the enormous talent of cooking of my grandmother) made this pension very successful. I took over this pension in 1987 and I am still (almost 30 years later) so in love with what I call here ‘My Mountain’. You are still welcome to come and enjoy the panoramic views and the historical character of ‘Les Olivettes’. Hopefully we meet each other here!